Great day Thursday. Tori asked me to come in and talk to her her sixth grade English classes about writing, which she wants them to concentrate on this semester. She wants me to come in each Thursday and talk about how I write and read them my latest chapters. Thursday was the first time. I’d done this before, back on St. Croix. I’d come in every Thursday afternoon with the new chapters and read to them. 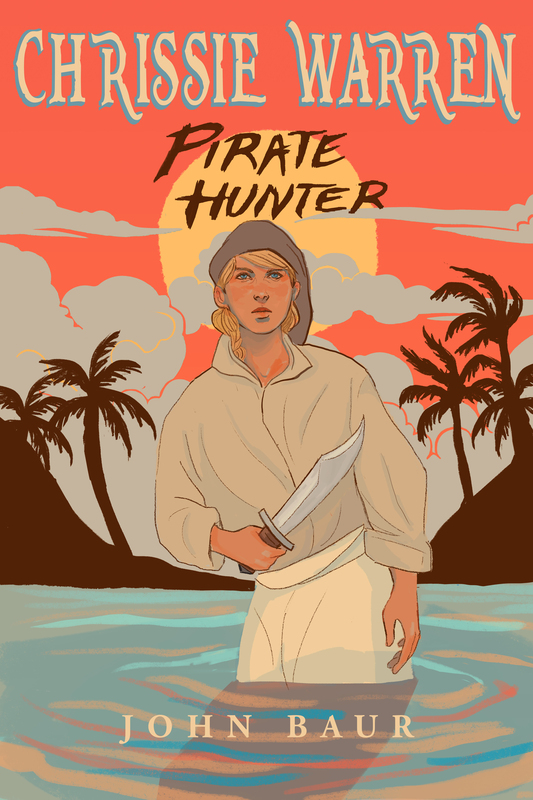 It let them follow the process of writing a novel and let me gauge their reactions to what eventually would become “Chrissie Warren: Pirate Hunter.” It was invaluable. I don’t know how anyone can write a story for middle schoolers without having real kids to bounce it off. I assume they got something from it as well. So I was looking forward to to it, although not without trepidation. The kids on St. Croix were fifth graders, these were sixth graders, and there’s a world of difference between the two. And unlike on St. Croix, where Tori taught one class of 13 motivated kids, she has two classes of about 30 kids each, ranging from bright, polite kids to kids who are, shall we say, less motivated and more difficult. And she doesn’t have the luxury of deciding the day’s schedule, when she’ll teach a subject and for how long, she’s got a firm schedule ruled by bells. I couldn’t just show up in the afternoon. I have to be there to get the last half hour of her second period class, then stay for the first half hour of her third period group. But it went great. The kids were more curious than anything, but they listened and for the most part they stayed focused. I talked about writing, and the fact that I had been earning a living at it for more than 40 years. I tried to tie my own experience and ideas about writing into things that I knew they’d talked about on other subjects, why writing is important, how shared stories tell us who we are as a society, what we think is important. And I talked about the magic of writing. It’s not an original ides with me, it may even be a cliche, but books are made of trees that are cut down and pulped then have ink smeared on them and are glued together. And when you look at those ink smears, the voice of the writer is in your head. It could be my voice, if you’re looking at “Chrissie Warren: Pirate Hunter.” Or the voice of someone who has been dead for hundreds or even thousands of years: Shakespeare, Homer. And that’s sort of magic, isn’t it? Then I read them the first two chapters of my WIP, a sixth grade story about two friends who always get in trouble but are the world’s only hope in the circumstances of the story. The kids laughed when I hoped they would, seemed interested, and got a big laugh where I hadn’t really expected one. I took note and will be revisiting that issue repeatedly. Afterwards I asked for feedback and ideas, and many of them had thoughts about what should happen next. (They were wrong, but I wasn’t going to tell them that.) I also talked about how you want to start a story as close to the action as possible, but you also have to set things up – the characters, the kind of world they live in, the circumstances of the story. Plus there are things I’m planting in the first three chapters that will pay off at the end, that will enable our heroes to figure out how to save the day. I told them the ancient Greeks (who they’re learning about in social studies) invented drama as we know it, and sometimes in their plays the situation was doomed, only to be saved at the last minute by an intervention from the gods. In all, I was pleased. And Tori was even more pleased. And I’m looking forward to next Thursday morning. And working hard so that I’ve got fresh chapters for them. Note: I haven’t written in a while, obviously. No excuses, but I’m back at it. The more I write, the more I write and that’s a good thing.